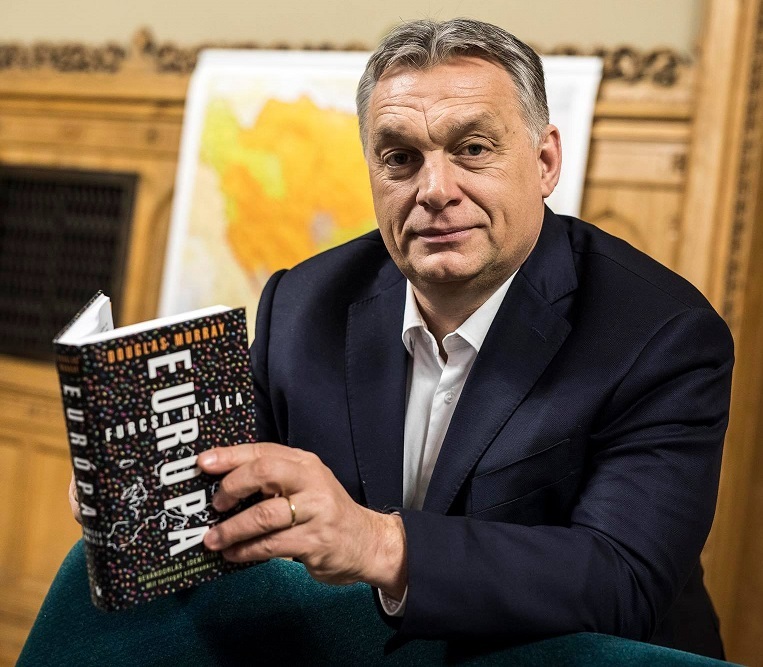 Viktor Orbán with a copy of Douglas Murray’s anti-immigration book, The Strange Death of Europe. The teaching of “gender studies” is no longer allowed in Hungary. This is part of an important cultural and ideological war that is redrawing the political, cultural, and intellectual landscape of the country. It happened in the middle of August: Students who have begun a course in “gender studies” at a Hungarian institution will be able to finish it, but no new courses will henceforth be permitted to start. This measure of Viktor Orbán’s new government has angered the opposition, which is more moribund than ever. “And what’s next, will abortion be prohibited?” asks the worried liberal-Leftist magazine HVG. “Will mathematics be banned?” Azonnali, another liberal-Left site, attempted to ask ironically. After his resounding victory last April, Prime Minister Orbán  made some changes in his administrative team. The one that caused the biggest fuss is undoubtedly the appointment of the great professor and surgeon Miklós Kásler to the head of the “Human Resources” super-department, which combines the former ministries of health, education, social affairs, and employment. Kásler is perfect for this job. With twenty-five diplomas, honors, and awards, this oncologist has been directing the Hungarian National Institute of Oncology and teaches at a university. At the same time, he is fiercely Christian and illiberal. According to him, liberalism has reached its limits, and strict obedience to the Ten Commandments would result in better public health. This has been enough to irritate and worry the liberal forces. At the same time, the ongoing work of the Szekler [Hungarian Transylvanian] journalist Árpád Szakács since spring has also been bearing fruit. In a series of articles entitled “Kinek a kulturális diktatúrája?” (“Whose Cultural Dictatorship?”) published in the nationalist, pro-Orbán newspaper Magyar Idők – he just issued the thirteenth  – Szakács has been denouncing the hegemony of the liberal Left in culture, naming names and exposing people, causing an earthquake with the appearance of each new article. His methodical denunciations have already led to the dismissal of an institute’s director who was too inclined to minimize the crimes of the Bolsheviks, and who was financing Left-liberal causes. This real cultural struggle against the hegemonic liberal-Left in cultural, media, and intellectual circles has been made possible because Viktor Orbán gave the green light for it. During his speech in Tusványos at the end of July , the strongman of Budapest made this clear. The idea is to put an end to the schizophrenia – or simple cowardice? – that is typical of the Right-wing man, who worries too much about the opinions, or even the moral judgments, of his opponents. The enduring success of Viktor Orbán’s economic policies, his masterful reelection campaign, and his growing influence in Europe, not to mention the collapse of the opposition – a veritable intellectual desert reduced to endlessly reciting hollow mantras, permanent infighting, and looking for solutions from outside the country – has given the illiberal camp in Hungary a historic opportunity to lead a de-liberalization campaign. After failing to remove those former Communists who had reinvented and entrenched themselves within the establishment between 1989 and 2002, Orbán’s Fidesz party is now trying to avoid making the same mistake; this time they want to expunge all the anti-national forces from the institutions. And “gender studies” will have to pay the price. It was announced this month that two universities – including the Soros-financed Central European University – which have been teaching this social pseudo-science, which is in fact nothing more than a tool for importing liberal ideology into Hungary, have been notified that it must be stopped. The opposition, inspired by Aesop’s “Boy who cried Wolf” fable, is continuing to cry “dictatorship,” but no one is listening to them as the people have grown tired of their loud complaints in response to everything Orbán does. Moreover, many of the would-be “revolutionaries” were on vacation at the time. But summer is nearly over, and we will soon see what sort of reactions this ban will provoke. For the Speaker of the Chamber of Deputies, László Kövér,  “gender studies” represents the import of “anti-social” and “extremist” ideas into Hungary. Indeed, Mr. Kövér has gone even further: He says that some try to pass off genderizmus (gender studies) as a science, whereas it is in fact only an ideology and “about performing experiments on human minds” which are in no way better than Nazi eugenics. Some questions remain unanswered. How was this situation allowed to arise in the first place? Who imported this to Hungary? Nevertheless, for the time being, we can at least say farewell to gender theory: Hungary does not want you here. And this is only the beginning. This article is reprinted from the Visegrád Post , a site specializing in news from Central Europe from a Rightist perspective.